Take a moment in time to enjoy the finest Swiss made timepieces in the world. Our collection of luxury Swiss watches is among the top collections in the world. 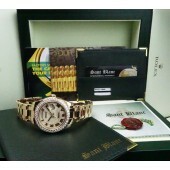 Each Rolex timepiece is pristine and perfect in every way.